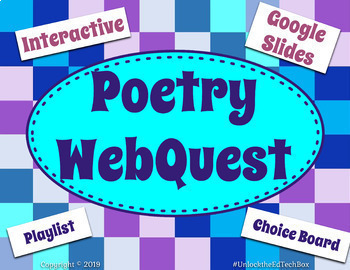 This Poetry WebQuest is a fun interactive way for your students to research poetry and show what they have learned. 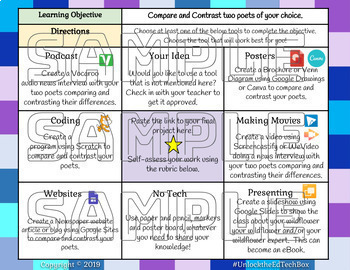 Created as a Hyperlink document with Blended Learning/Choice Board for students to choose their demonstration of their learning, students have choice and voice. This activity includes Poetry Terms, Types of Poetry, and Poets to research. 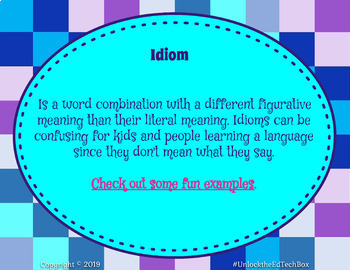 Poetry Terms include: Alliteration, Idiom, Metaphor, Simile, Onomatopoeia, and Analogy. Types of Poetry include Limerick, Acrostic, Haiku, Lyrical, and Free Verse. The poets include Jack Prelutsky, Ken Nesbitt, Bruce Lansky, Judith Viorst, and Shel Silverstein. Students will choice from a Choice Board/Playlist how they want to show their comparisons and contrast of two poets. 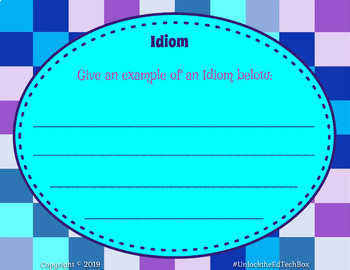 This activity can also be downloaded and used in a PowerPoint format.